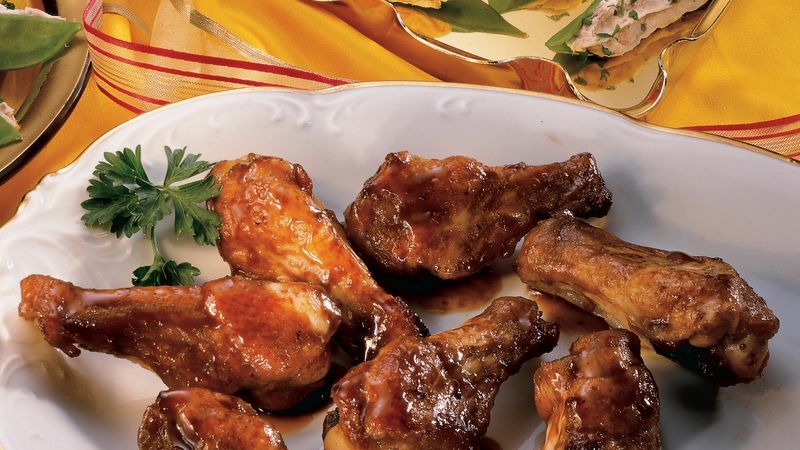 In ungreased 12x8-inch (2-quart) glass baking dish, arrange chicken drumettes in single layer. In 1-cup microwave-safe measuring cup, combine honey, mustard and soy sauce; mix well. Microwave on HIGH for 30 seconds. Stir until well blended. Drizzle honey mixture over chicken, brushing as necessary to coat chicken. If desired, cover and refrigerate up to 2 hours. Heat oven to 375°F. Uncover dish; turn chicken drumettes. Bake 50 to 60 minutes or until chicken is tender, glazed and no longer pink next to bone, turning chicken once halfway through baking time. Just before serving, brush with honey mixture from dish. MAKE-AHEAD TIP: To make ahead, prepare and bake drummies as directed in recipe. Place in covered container; refrigerate up to 24 hours. To reheat, place in foil-lined 15x10x1-inch baking pan. Heat at 350ºF. for 20 minutes or until thoroughly heated.